As I was searching for the story, I found many other stories about these beautiful street murals all around the country designed to show the culture and beauty of Brazil to the world. Some are also meant as political protest, others depict historical events, and many capture the current team and national pride. There is even a Google Street View collection of this art. This got me thinking about our classrooms and school buildings. As I visit other schools and talk to other teachers, all too often I see the same bland designs with the same teacher-supply-store posters on the walls. I’m in the process of moving to a new school and when I announced it to my students, one of the first questions I got was, “Do you have to paint over the walls?” The painted walls in my classroom had come to reflect the culture and a sense of pride in my students that transcended me. Each summer for the past 4 years, I welcomed in some of my incoming 8th graders for 3 or 4 days of painting. The first year was the toughest and I learned a lot of lessons on how to make it easier. I started with simple Wordles projected on the walls and then gradually added more difficult art as the years went on. Each year, I met with the students and brainstormed some ideas they wanted to add and I let them personalize it every year in some aspect so they could call it their own. I was running out of wall space and the teacher that inherited my room has very little space to continue unless she gets creative. 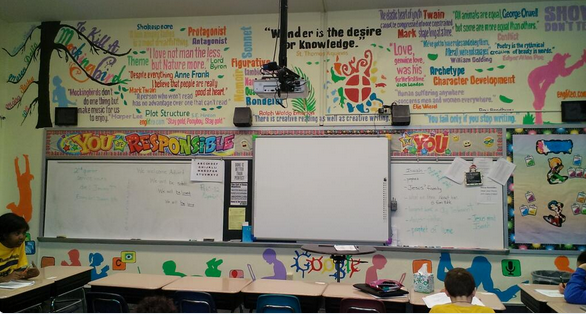 Many teachers visiting my classroom tell me they wouldn’t be allowed to paint their room like mine. That saddens me. Our classrooms should reflect our culture. Our schools should do the same. Schools with extensive murals (regularly updated or added to murals) reflect back on the students, staff, and community. And, I’m not just talking about the mascot painted on the wall outside the gym. Principals and teachers should invest their students in the project and personalize it. Much like the street murals in Brazil, they should represent a school pride to everyone that enters your doors. A Third Iteration of the Flipped Classroom?